The Bosch HDS183-01 Drill/Driver features KickBack Control, which reduces the risk of sudden tool reactions in binding conditions. This integrated acceleration sensor automatically shuts the tool down when a potentially dangerous rotational torque reaction occurs in a bind-up scenario. The drill was engineered with an upgraded, heavy-duty all-metal chuck that furnishes increased robustness and high torque transfer. With an efficient EC Brushless motor, this drill/driver provides longer tool life as well as great runtime. One of Bosch's Compact Tough designs, it has a short head-length and light weight but plenty of muscle. It delivers a powerful performance, with 531 In.-Lbs. of torque, two drilling speeds (0-1,900 rpm for high speed and 0-600 rpm for high torque), an impact rate of 28,500 bpm and 20+1 precision clutch settings. The kit includes two 18V 4.0 Ah FatPack batteries and a charger, to deliver all-day power, and a long belt clip for a secure hold. Specializing in the most light weight and compact tools, Bosch 12V MAX tools are designed for easy use while still packing enough power for the job. To guard against overheating, overload and unnecessary discharge, the Bosch 12 V Lithium-Ion batteries include Electronic Cell Protection (ECP); increasing the life of the battery and tool. Bosch 12V MAX tools come with the ProVantage three-year protection plan, which guarantees two years of battery protection and one year of tool protection. Under this plan, you can receive two years of free battery replacements, tool replacement for one year, and a free tool repair package for the second and third years. The Bosch PS31 12V Max 3/8 In. Drill/Driver has professional-grade power for 90 percent of tasks, but it weighs just over two pounds. An ideal tool to carry to any worksite, this tool provides 265 In.-Lbs. of max torque. With two speeds (0-350 rpm and 0-1,300 rpm) and 20+1 torque settings, it is a carry-along solution for applications such as installing and electrical work that requires a great deal of overhead drilling and driving. It features a 3/8 In. single-sleeve three-jaw chuck that securely holds bits. It has an integrated LED light, an integrated fuel gauge and Bosch's lightweight 12V Max power system that delivers longer runtime with no increase in weight. The Bosch PS32-02 12 V Max EC Brushless 3/8 In. Drill/Driver comes in at a weight of only 2.0 Lbs. and a head-length of only 6.5 In.. This light handy powerhouse is a terrific solution for contractors or MEP pros who have extended overhead or hard-to-reach applications. And this cordless drill provides an EC Brushless motor that delivers 180 In.-Lbs. of torque. This is outstanding power for the most compact and lightest weight Drill/Driver in its class. It has a two-speed setting, with a high-torque setting for driving and a high-speed drilling setting, and it has 20+1 clutch settings for max versatility. The kit includes two 12 V batteries and a charger for all-day work. The Bosch HDH181X-01 18 V Brute Tough 1/2 In. Hammer Drill/Driver easily handles all heavy-duty jobs, with features such as Active Response Technology, an Open-Frame Four-Pole motor and a sure-grip side assist handle. Active Response Technology reduces the risk of dangerous kickback, giving the unit greater control in bind-up situations. Bosch's electronic motor and cell protection help prevent overheating and overloading. Durashield composite housing and an all metal gearbox can bounce back from 25 drops from 12 Ft. high. The side handle is longer to boost control during use, and it is adjustable to 23 positions. This unit is comes with a ProVantage three-year protection plan. 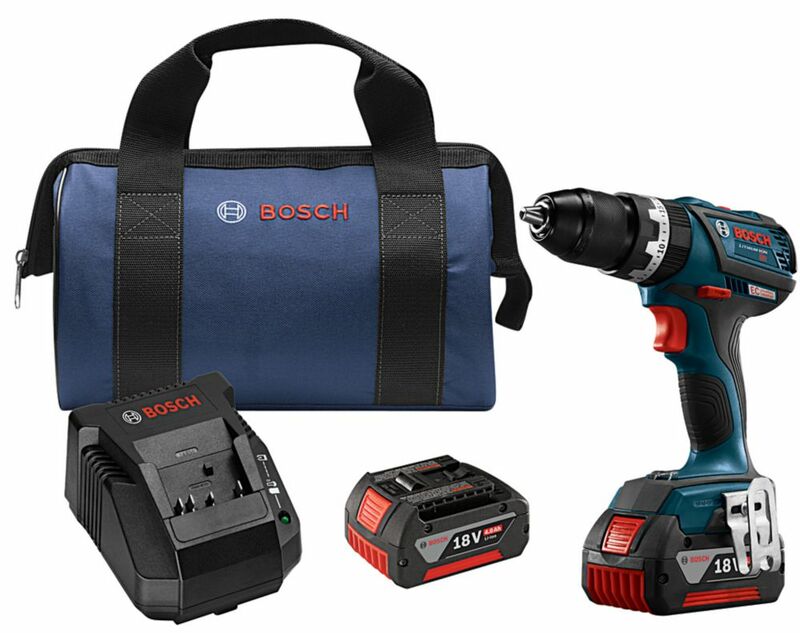 18V EC Brushless Compact Tough 1/2 Inch Hammer Drill/Driver Kit The Bosch HDS183-01 Drill/Driver features KickBack Control, which reduces the risk of sudden tool reactions in binding conditions. This integrated acceleration sensor automatically shuts the tool down when a potentially dangerous rotational torque reaction occurs in a bind-up scenario. The drill was engineered with an upgraded, heavy-duty all-metal chuck that furnishes increased robustness and high torque transfer. With an efficient EC Brushless motor, this drill/driver provides longer tool life as well as great runtime. One of Bosch's Compact Tough designs, it has a short head-length and light weight but plenty of muscle. It delivers a powerful performance, with 531 In.-Lbs. of torque, two drilling speeds (0-1,900 rpm for high speed and 0-600 rpm for high torque), an impact rate of 28,500 bpm and 20+1 precision clutch settings. The kit includes two 18V 4.0 Ah FatPack batteries and a charger, to deliver all-day power, and a long belt clip for a secure hold. 18V EC Brushless Compact Tough 1/2 Inch Hammer Drill/Driver Kit is rated 4.3 out of 5 by 4. Rated 2 out of 5 by MAKEGARYGREATRAGAIN from WAS GREAT.....UNTIL PURCHASED THIS TOOL "NEW" FROM A THIRD PARTY SELLER. LOOKED NEW, SMELLED NEW, FELT NEW. WORKED GREAT FOR ABOUT TWO MONTHS ON LIGHT JOBS. NOW I FINALLY GOT AROUND TO USING IT DAILY JUST DRIVING SCREWS, AND IT INTERMITTENTLY STOPS WORKING AND THE LIGHT TURNS RED ON THE HANDLE. COULD BE THE FIRST SCREW OF THE DAY, OR THE 10TH. NO RHYME OR REASON. TRIED SWITHCING BATTERIES, BUT PROBLEM STILL PERSISTS. QUITE AGGREVATING I MUST SAY. I WAS ACTUALLY SUPER PLEASED WITH IT UNTIL IT STARTED WORKING SPORADICALLY. FEELS NICE IN THE HAND AND FITS IS SUPER TIGHT SPACES. Rated 5 out of 5 by No Name from Best hammer drill. I have purchased 2 of these in the last 3 years and have never been more satisfied with the quality, construction, and the torque. The value for the money is exceptional. I have found that the Bosh tools, (I have 6 of different types) have a better longevity than most and have been replacing my other tools with the Bosh Brand. Rated 5 out of 5 by ExpertHandyman from Great reliability! I am a handyman and I am using it heavily since 2 years. It's a hammer drill and it's lighter than most regular drills. It's compact size is very helpful in tight spaces. The battery lasts forever because of the brushless motor. Rated 5 out of 5 by Kjpowers84 from Tough and durable All of our Bosch drills, including this hammer drill are tough and durable. They are able to survive my guys and the job sites we work on! !